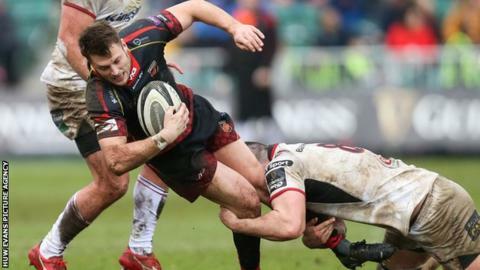 Ulster went back to third place in the Pro14 Conference B with a convincing 28-15 victory over the struggling Dragons in muddy conditions in Newport. Their bonus-point try came from captain Alan O'Connor when they were down to 13 men, with two late yellow cards. Jordi Murphy crossed for the only try of the first half with Marty Moore and John Cooney adding further scores. Dragons' scores came from a penalty try and a Taine Basham touch-down. It was the Dragons' final match of the season at Rodney Parade, with a tally of four home Pro14 wins marking only a slight improvement on the previous season despite their summer recruitment efforts. Wales squad prop Leon Brown made his comeback after three months out with a hand injury, playing the second half, but his fellow Wales international Hallam Amos came off with an elbow injury after 55 minutes having tried to play through an earlier knock. Ireland internationals Murphy and Cooney returned for Ulster after featuring in the win in Italy, while Dragons lost their most experienced player and captain Richard Hibbard to a rib problem in the warm-up. Stand-in skipper Harri Keddie was also an early departure, limping off just after Josh Lewis slotted a 17th-minute penalty to open the scoring, Brok Harris taking over the leadership. But Ulster were dominating possession and territory, Murphy eventually crossing from close range for Cooney to convert after 24 minutes, while wing Robert Baloucoune came close five minutes later only to be denied at the flag by a last-ditch Jordan Williams tackle. Ulster had centre Darren Cave sin-binned after 35 minutes for an early tackle on Lewis following Basham's break out of defence, but the visitors took a 7-3 lead into the break. They soon pulled clear with prop Moore crashing over for another short-range effort and Cooney being worked clear after some slick handling in the 50th minute, the scrum-half adding both conversions before leaving the fray as Ulster rang the changes with a 21-3 lead. But Ulster were reduced to 13 in the final quarter as wing Rob Lyttle was harshly yellow-carded for an interception attempt moments before Louis Ludik was more justifiably binned for a deliberate knock-on, conceding a penalty try in the process. The visitors' pack responded in remarkable fashion as their forwards put the ball up the jumper for skipper O'Connor to earn the bonus point, Billy Burns converting. Basham scored a 77th-minute try as Ulster finally ran out of numbers, but it was little consolation. "(Overall at home) we could have been better, but I think generally since Christmas the performances have been pretty strong, with two blips against a strong Clermont team and over in Benetton." "It's a tough place to come, so to come and get a bonus-point win, we're over the moon. It's not ideal to be down to 13, but the way the boys put the ball up the jersey, attacked and scored a try was massive. "When we had our full quota, I thought we did a pretty good job on both sides of the ball. It's always nice (to be in the play-off places), but it's not that nice, it's only nice when you get to the last game." Ulster: L Ludik; R Baloucoune, D Cave, S McCloskey, R Lyttle; B Burns, J Cooney; E O'Sullivan, R Herring, M Moore, A O'Connor (capt), K Treadwell, C Ross, J Murphy, N Timoney. Replacements: A Warwick, J Andrew, W Herbst, I Nagle, M Rea, D Shanahan, J Hume, P Nelson.